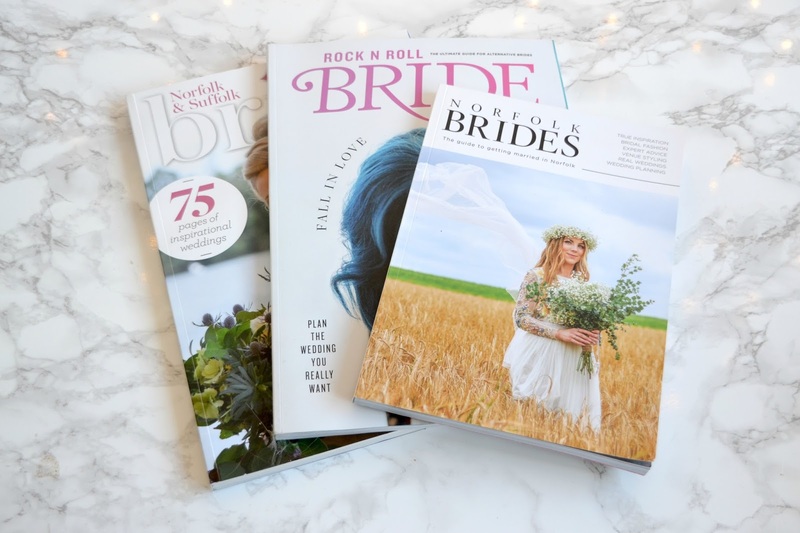 It’s been a while since I posted about my engagement and I thought I would update you with some of the things I have planned, and what I still have to do before the big day, which is just over 10 months away now! One of the first things I sorted was my venue, as there was no point in having a wedding without somewhere to go! I looked online to find the perfect place and browsed countless websites and price lists trying to find somewhere that stood out to me. In the end we narrowed it down to just a few and decided to go and look at them in person. When we found the one, we instantly knew it was perfect for us. Our first date was at the zoo, so we chose somewhere that was right next door to one – convenient or what! Carrying on from the zoo theme, we thought we would make our centrepieces to fit in with different animals. I started to source plastic animals and then spray painted them with gold. We are having a red/gold/silver festive type theme so thought they would go quite well in the middle of the tables. I still have a few different animals to get but I am getting there slowly. We will have these alongside some poinsettias which are really good value for money and readily available at that time of the year. The dress was also up there with one of the first things I sorted and I am so pleased this is out of the way. I will talk more about my dress after the big day but for now I will say I have bought it, it is ready and waiting for my first fitting in April. Luckily this is only a length fitting so I still have some time to get to the weight I want to be before they start doing the width. I will be wearing converse on the day which I haven’t yet bought but will wear an older pair for my fitting to get the correct height. 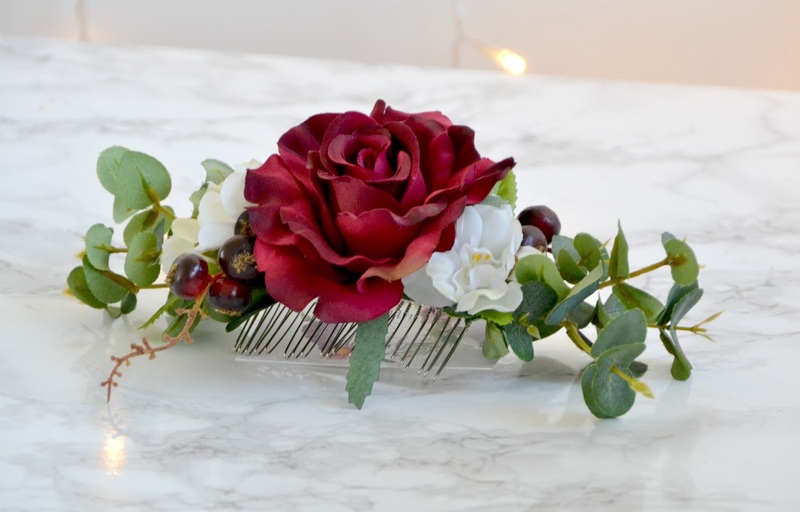 Although I have no idea what I am going to do with my hair yet, I have got my hairpiece. My mum bought me this gorgeous winter flower arrangement from Etsy which will go perfectly with my theme. I also have a veil, so this will clip onto the top of that nicely. This is something I have only just started as I wanted to make all of my invites from scratch. I have bought all of the materials from various places such as The Range and Hobbycraft and have officially made about 3. There are still a lot more to go but this is something I aim to do over the next few months so they are ready to go out at the end of the summer season. Next on my list are a few finishing touches including, signs, banners and favours. 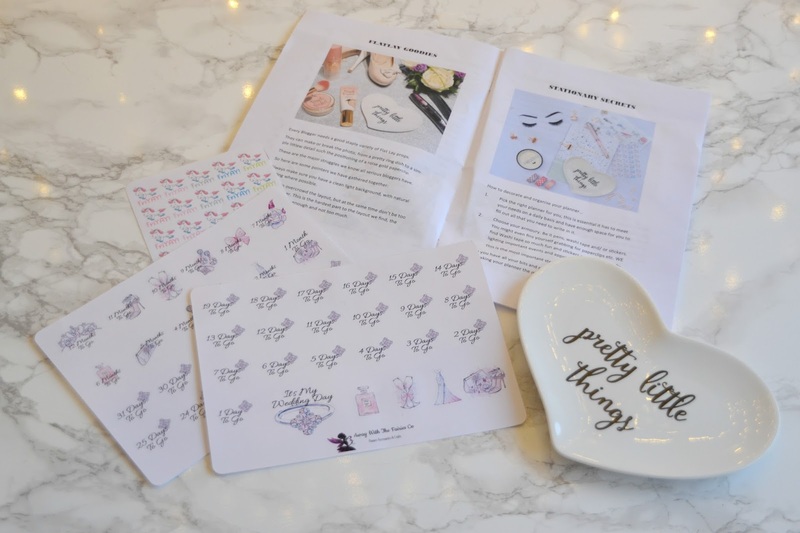 These little things are all available in one place on the confetti website, which is really convenient for me. I think it is important to have little bits and pieces here and there to really set off a theme. It’s the finishing touches that can really make a difference on the day! Are you getting married? What plans have you made? 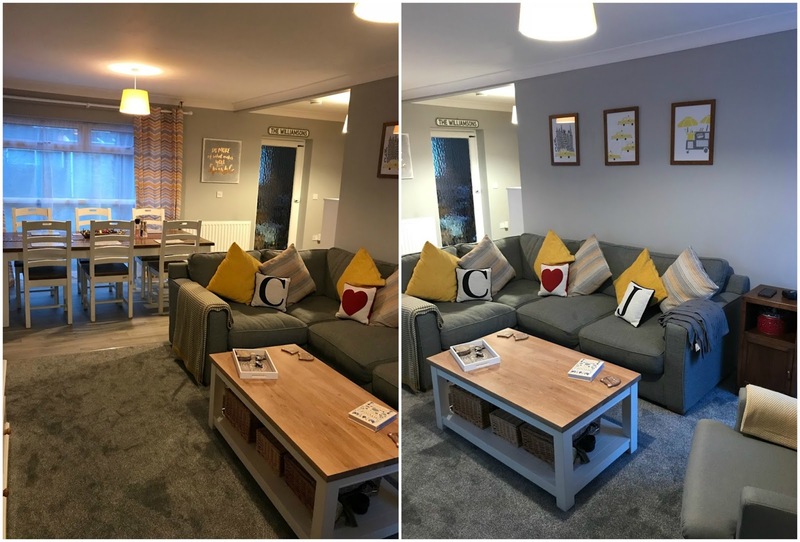 When we first moved house, we decided that one of the first rooms we wanted tackle was the living room, purely because it’s the room most people will see when they come to visit. Saying this, we did the bedroom first and the living room got pushed back due to lack of funds as it needed a lot more work than we anticipated. Our living room is ‘L’ shaped and we only have a small kitchen so we opted for a lounge – diner design so we would have somewhere to fit a dining table. The room was wallpapered in yellow with a very floral 70’s style carpet which we knew we wanted to get rid of right away so out it came and we put up with awful tiled floors for a long long time. The first step was to strip the wallpaper. 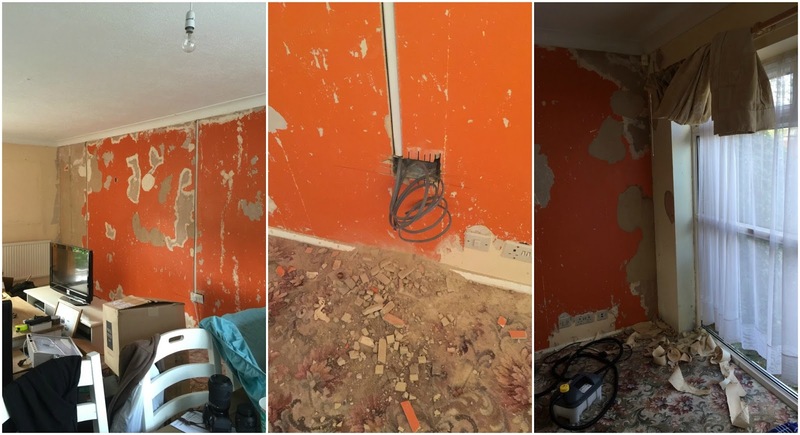 Thankfully we borrowed a wallpaper stripper which made the job slightly more bearable but it was still a messy task. We had our electrics rewired too which left us with various holes in the walls. Some of the wallpaper had been put on top of wooden cladding style walls and some was straight on the plaster so it was interesting seeing what was behind the walls. This was a messy and stressful job in itself especially as we could not get behind the radiators and chunks of walls were falling off every time we tried to strip large sections of paper. My dad then came round and put cement and bricks in any larger holes and it was then down to a plasterer to do the rest. It took us months to arrange a plasterer as they all seem to be so busy! We knew it was going to be an expensive job too so put it off longer than we needed. 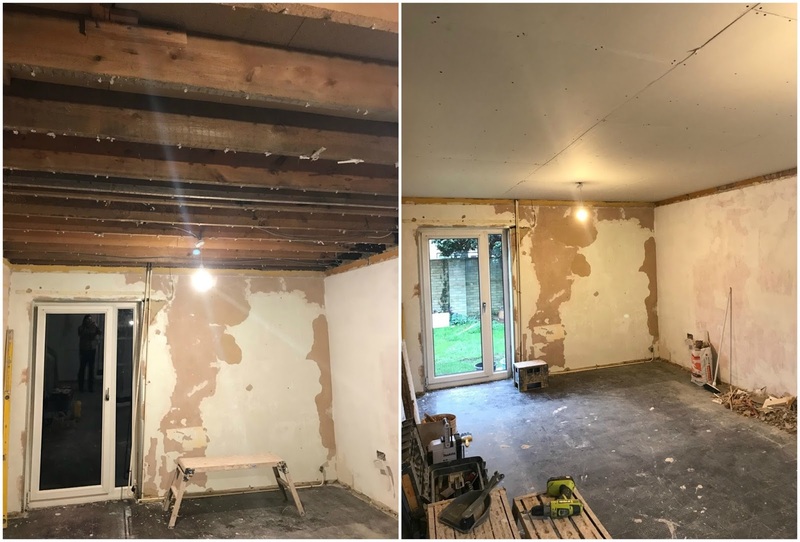 The plasterer made a start on the ceiling and noticed it had dropped, resulting in the whole ceiling needing to be taken right down to the rafters and new plasterboard put up. 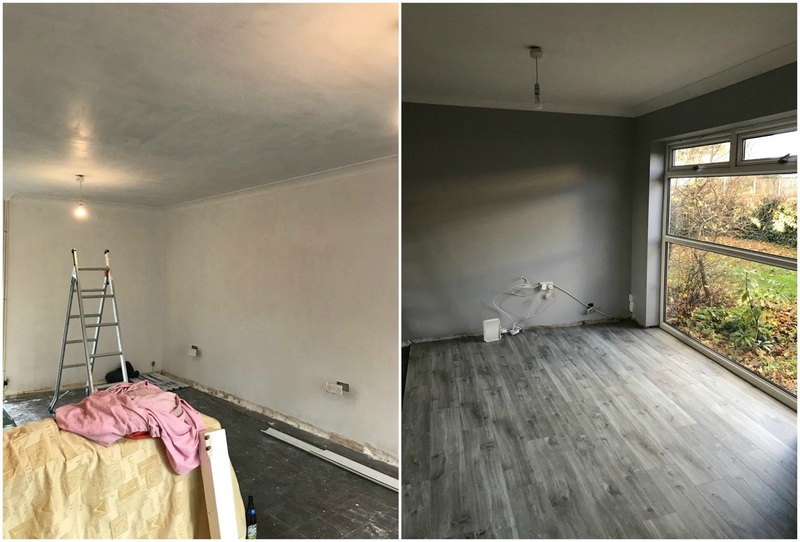 Eventually we got it done, we had the ceiling smoothed over which I think gives it a much more modern and fresh feeling and all of the walls were smoothed over. It was a big job which resulted in a weeks work! But I was so pleased with the results. It was like a completely different room. Next up was adding coving around the tops of the walls to cover any gaps and imperfections. Once this was up we could then get everything painted in a white wash coat. Due to the room being covered in fresh plaster, we needed to do a white wash on all of the walls. It took a good few coats before it stopped sinking in, and then finally we could add some normal paint. We chose a shade of grey called Chic Shadow as it can go with anything. We have little yellow touches around the room and these can be changed if we want a refresh without having to change the entire paint scheme. We then had new radiators put on after what felt like the longest time without heating in the freezing November/December months. This room was very cold last year but now that we have a thicker plasterboard on the ceiling and brand new double radiators, this room warms up a treat. We hope to one day add an extension in this room and we will probably then move the dining area into there. This room currently has a large front window and also a window at the back of the room which can let in a lot of light, however if you do not have this option in your own home you can always install a Velux Roof Window. There are a great selection over on VELUX roof window shop. A Velux window is a fantastic way of letting light into a room if your ceiling allows. They are great for loft conversions and extensions and will be ideal if we expand on this area in the future. Next up was the floor and skirting. We spent a lot of time thinking about what floor we wanted and in the end we decided the best option was to have wood effect, as it is easier to clean. We chose some Quick Step Livyn floor which is essentially vinyl but with the appearance and thickness of wood. It is quite expensive but it is guaranteed to last years and years and is made from 5 different layers. Not only is it waterproof, it is sound reducing as well. 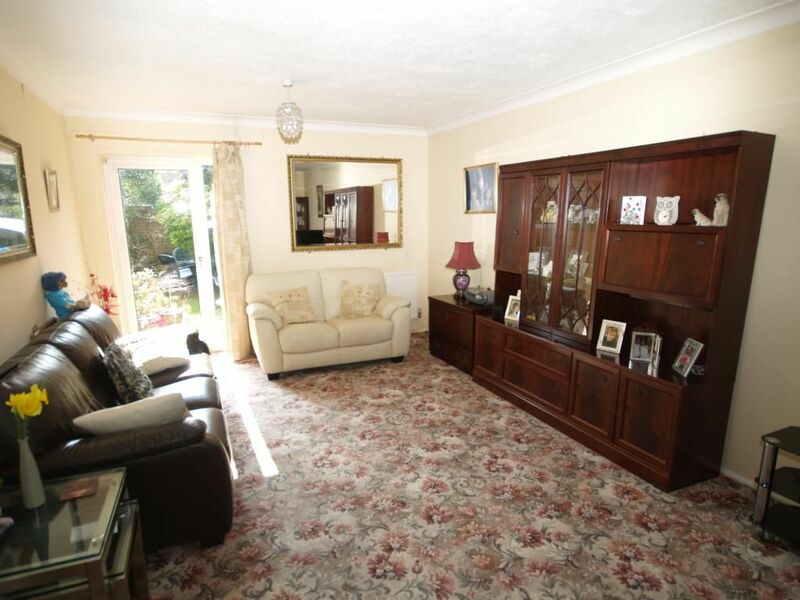 I thought it would be great for the area next to the kitchen and where we keep our dining table but at the same time we wanted the floor to be cosy and a rug just wasn’t cutting it. In the end we decided to go half and half. 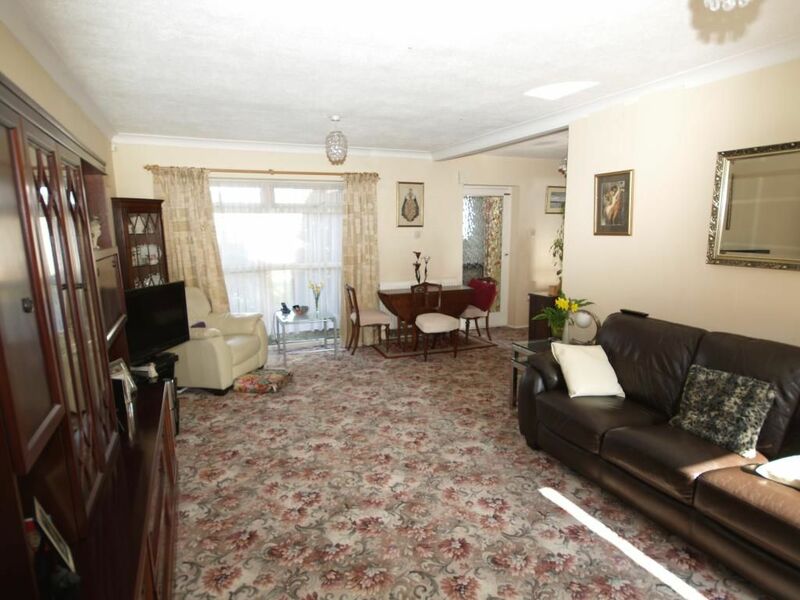 We placed carpet on the side of the room where the sofa and coffee table is so that area is nice and cosy, and then put the quick step across the other high traffic areas where people would be likely to be wearing shoes or dropping food on the floor. The previous owner left us these large mirrors with an ornate gold coloured frame. It seemed a shame to waste them so we decided to keep them and paint the frames to make them fit in with our own décor. This is not however on the wall yet as we are still deciding whether we need a bookshelf that side instead. We added some of our own photos and prints to the walls to liven the place up too. I really liked the grey and copper print that I found in Next, so tied that in with a few copper accessories. I put a couple of shelves above the table to give us a bit more space. I adore my family road sign that I got from etsy! When it comes to furniture and décor, our items were from a variety of places. Our grey corner sofa came from Harveys and I furnished this with yellow cushions from BHS and striped ones from M&S. The grey and yellow light shades came from Wilko at a respectable £4 each! Bargain! I bought the coffee table in the Homebase sale for around £100. It was exactly what I was looking for and the coasters and cacti were gifts from friends. The TV stand is the Liatorp Ikea unit for £180, it’s the perfect size for what we need and we can fit all of our bits and bobs in the drawers. The curtains come from George at Asda. 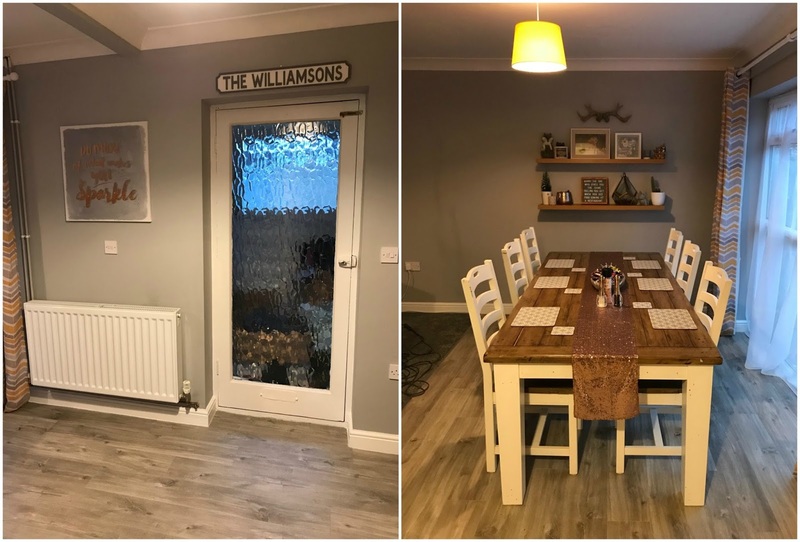 Our dining table and chairs came from The Cotswold Company and were a bargain, reduced from well over £1000 to a more manageable £400 due to there being some cosmetic damage which was easily sanded/painted over! Its massive, but I love it and we can sit at either end and throw each other the salt and pepper. We also got a little chair for the end of the room to fill the space that was there. We didn’t really know what else to put here but I think it looks great and is handy for if people come over. The chair came from The Range and was £140 (wishing I still worked there for that 25% discount!) The cushion was a gift, as was the throw! The cat seems to have claimed this spot though! Since January has begun I have been trying to get healthier and make sure all of my meals are planned. I have been having a good variety of foods for my evening meal and changing my lunches up every week too however the one thing that has stayed the same was my breakfast. I was craving something new, something different and then Nutribuddy reached out to me with a product that could not only help with my weight loss but also ‘shake up’ my breakfast routine. I received this product called ‘Nutribuddy Breakfast’ which in simple terms is a blend of ground oats, seeds and coconut. It’s quick and convenient, I literally need to add milk and shake and it’s done! It comes in 3 flavours, Chocolate Brownie, Vanilla and Naked (unflavoured/unsweetened). I chose the Chocolate Brownie flavour and received a 14 day supply so thought I would give it a go. A 14 day supply costs £14.99 and comes in a glass clip top jar however you can save £1.99 by getting a refill pack. I also received a shaker which you have the option of adding to your order for just £7.99. It’s really handy to have in my opinion. I have only tried this for a few days now. In the mornings, I took 3 scoops of the product and put it into the shaker. I then added around 300ml of milk and its just a case of shaking until smooth. You can also use almond milk, soya or even coconut. The more you shaker, the smoother the drink becomes. You can also add fruit and pop in a blender if you prefer, or if you have a bit more time you can add to a bowl with fruit, nuts and seeds. I may try different versions throughout this trial period to see how I get on. Stay tuned for a full update in a few weeks when I have finished the jar if you’d like to see my results. *I received this item free of charge in exchange for an honest review. 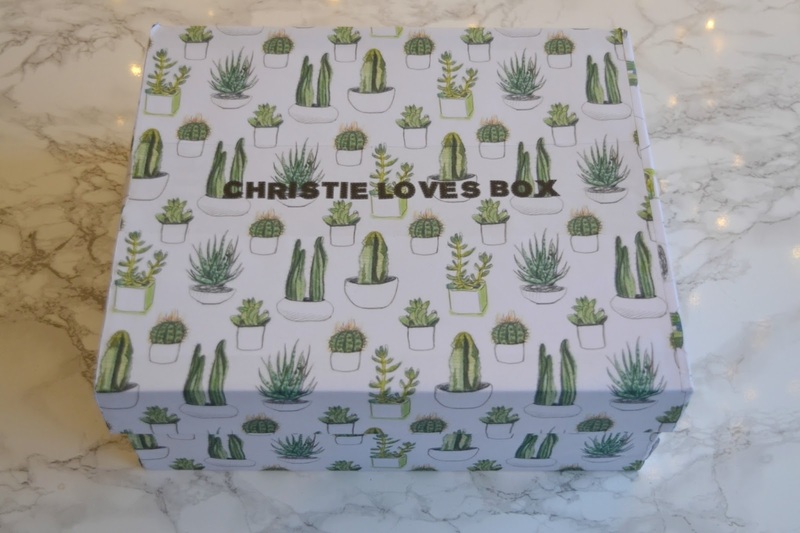 If you saw my last post on 'What I got for Christmas' then you would have seen the sneak preview of one of my gifts, the Christie Loves Box. I received this from fellow blogger and bestie Kim. When I unwrapped the outer layer of paper, I was so excited at what I saw and intrigued as to what was inside. The box was covered in cactus print paper. I was really impressed how she managed to wrap this all up and align all the paper so it all looked like one piece! The box was filled with everything that I love, and most impressively a magazine alongside the gifts. I could tell a lot of thought and effort had been put into creating this and I loved it! I didn't read it straight away as I didn't want to spoil what gifts I was about to open. 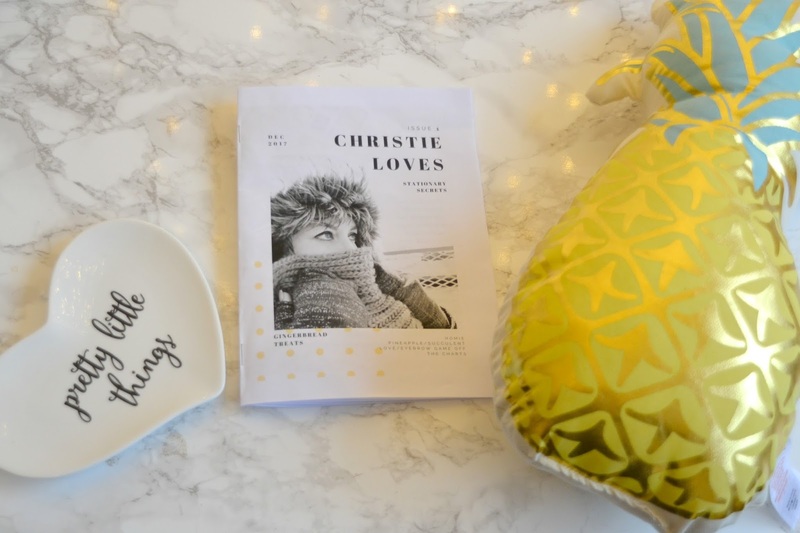 There was a page on home decor which featured this gorgeous pineapple cushion, as well as saying that all of the decorating I was doing was sending me 'fruity' (get it?!) in the head! It suggested that this cushion would look great in a home office and I agree, and that is where it will be showcased! As well as the cushion, I received this lovely little dish which is great for flatlays and some flatlay tips from the expert herself! I was over the moon when I opened up one of the little bags filled with makeup! 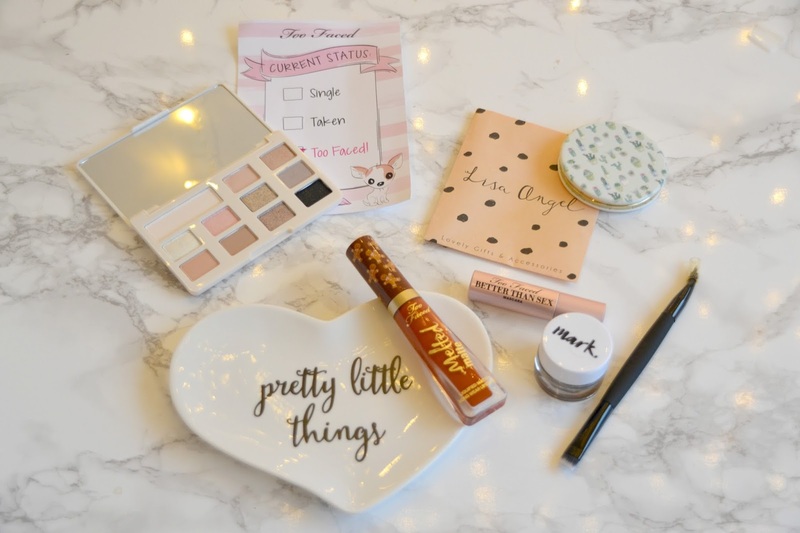 I felt spoilt to see that I had some Too Faced goodies including the gingerbread melted matte lippy, white chocolate chip palette and also mascara. I was really impressed by the eyeshadow palette and it smells amazing too. This liquid lipstick is SO GOOD and by far the best lip product I have owned. I wore it Christmas day and it took a lot to budge it, even after eating. The little magazine did warn me about the velvet applicator but I saw past that when I realised how fantastic this was. I want more colours now! I can see why Kim swears by them! I also received an eyebrow shade which I am yet to experiment with and a gorgeous mirror from Lisa Angel which also follows the cactus theme. As well as some flatlay tips in the magazine there was also a section on planners. I received some great stickers that I can use in my 2018 diary! I especially love the wedding countdown ones, I have put these on my calendar so I can see them and have used the dress sticker to mark my next fitting. It's less than 11 months to go now, eek! Finally there was a few other pieces that tied in with the magazine. 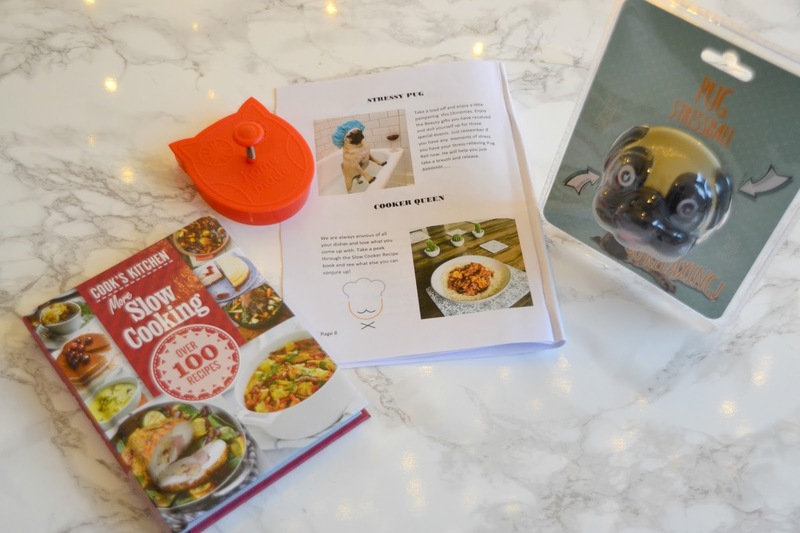 I got a slow cooker recipe book, cookie cutter and a pug stress ball. I especially liked how the magazine had a photo of one of my slow cooked meals, it really was very well thought out. I can't wait to try out some more. Overall I really loved receiving this box and it definitely filled a hole where My Little Box used to be. It was just so thought out and the gifts were really lovely. Thank you Kim for such a great gift! Have you ever created anything like this for one of your friends?